This post is sponsored by Evereve. As always all thoughts and opinions are my own. Happy Monday Friends!! I hope you all had an amazing Thanksgiving weekend and spent lots of time with family and friends, eating lots of turkey and doing some shopping. 🙂 Who can blame us right? 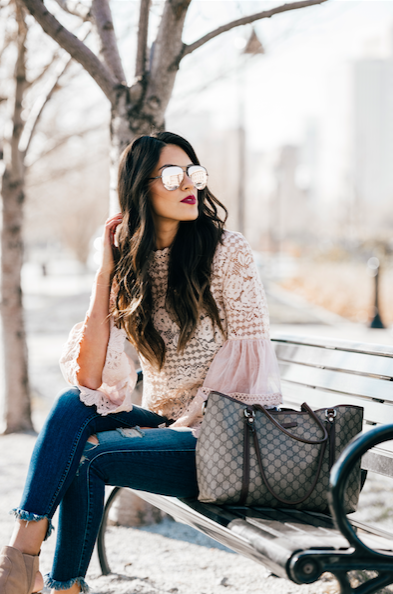 Now onto the real reason you guys are here; to get all the details of this super cute outfit and this gorgeous blush pink crochet bell sleeve top right? Ladies, if you haven’t heard of Everett, then you are totally missing out. This store is geared towards us mamas and kiddos, but for woman in general. 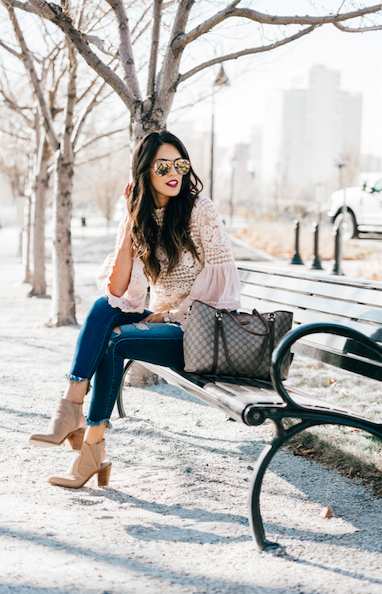 My bell sleeve top and destroyed scallop hem jeans were one of my recent purchases from them and I am obsessed. I remember shooting this look in Utah and showing you guys on my Insta-stories and I received so many questions about it, so I am super excited to finally give you guys all the details. Thanks so much for stopping by and have a great day shopping!! That top is so pretty! 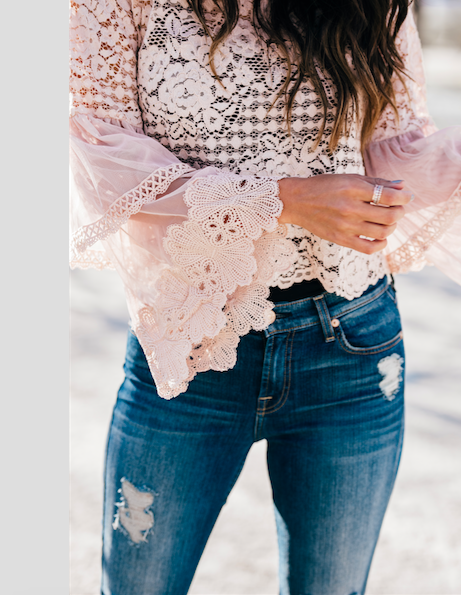 I love the mix of lace and crochet!! I love that top and the color – such a cute look babe! That top is just to die for! That top is absolutely gorgeous! You look stunning! Love this top babe! so cute! so many good deals! This outfit is so perfect girl, the top is beautiful and I love your sunnies!! And great sales this season! That blouse is beautiful with all of the details! What amazing sales you have featured here! And that top makes you look so angelic. Absolutely stunning! I love the beautiful detail of the lace on the top:) Also your lip color is perfect! this blouse is SO pretty! Thanks for the awesome roundup of sales! This crochet top is gorgeous! Cyber Monday is one of my favorite shopping days of the year! So many good deals.